Faith, Hope, Happiness & Love: Teacher Registration Australian Citizenship Job Applications Resume Touch Ups Overdue Fines Bills Budgeting Car Registration Insurance Is Anyone Out There Feeling this Way??!!! Teacher Registration Australian Citizenship Job Applications Resume Touch Ups Overdue Fines Bills Budgeting Car Registration Insurance Is Anyone Out There Feeling this Way??!!! 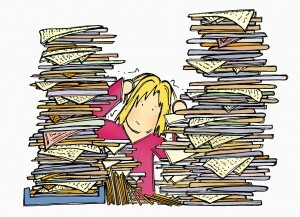 I am 'the paperwork girl' in our little family. Maggie or Ana may usurp me in this call as they grow older, but for now they're about as motivated as James is in the paperwork department. I take care of budgets and bills and applications and all that jazz. I used to get a kick out of crossing all the t's and dotting the i's. I always kind of love a good, completed form that I know won't be sent back for more details, because I didn't miss a thing. Weird, but we all take pride in something! :) The last few years have taken a bit of a toll on this pleasant little piece of housekeeping for me though. Possibly my only real memory when I think of my last semester at uni is the endless paperwork I had to do. I remember 'photocopying my life' - so many times over that I ended up just photocopying a kazillion copies of my birth certificate, marriage certificate and passport, and getting them all certified at once from a Justice of the Peace. I'm sure it took ages and the people in line behind me wanted to throw things at my head, but sometimes you just gotta get it all done!! It seemed like every governing body and every application centre wanted a new bunch of random details (with proof attached - copies of everything certified by yet another Justice of the Peace) and it was crazy. THEN, we applied for James to become an Australian Permanent Resident. Boy if I thought graduating was a toll on my satisfaction for completing paperwork, I had another thing coming. We had to 'prove' we were in love. Letters and invitations addressed to both of us from the entire course of our relationship and marriage, proof that we stayed in touch through any absences, wedding photos, honeymoon photos, engagement photos, photos at different events, scrapbooks, joint power bills, etc., etc. Then we had to give in all the usual proof of identity, lack of criminal record, good intentions, upstanding good character, etc for both of us, because I was 'sponsoring' James. Awesome. We got it on the spot. I ended up being super over-prepared, because it turned out that having a baby together proved we were obviously in love (phew! ), or at least stuck in each others' lives forever if we weren't!!! Bless Maggie. Oh, and my BIGGEST paperwork oversight: Forgetting to return the form asking (as James had come to the end of his drivers licence points from an obscene amount of speeding tickets) if James wanted to go on 'probation' for 6 months, or lose his licence completely for 3. Because I didn't return it, he automatically lost it for 3, and it was the bane of both of our existences (sigh). And then it was like it was my fault James lost his licence!!!! (BIG sigh!!). Haha! I don't think you are really dreading James graduating from Uni. at all! Oh my goodness! ABBY! That picture is YOU!